Saint Bartholomew is one of the Twelve Apostles, mentioned sixth in the three Gospel lists (Matthew 10:3; Mark 3:18; Luke 6:14), and seventh in the list of Acts (1:13). The name (Bartholomaios) means "son of Talmai" which was an ancient Hebrew name. 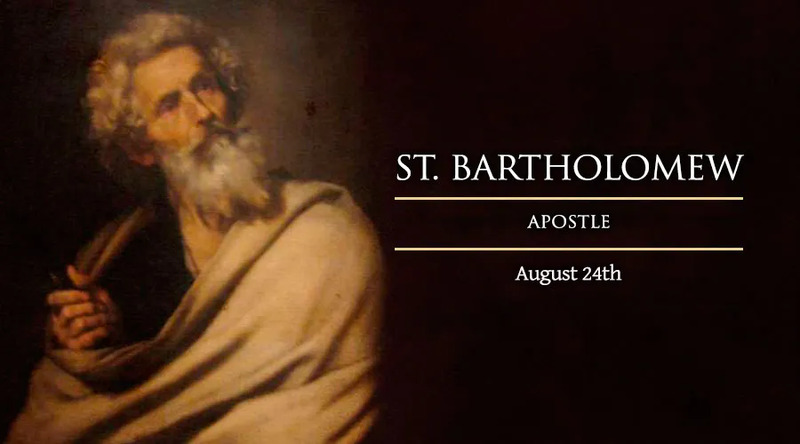 Besides being listed as an Apostle, he is not otherwise mentioned in the New Testament, at least not under the name Bartholomew: many ancient writers, and Catholic tradition have identified Bartholomew as Nathaniel in the Gospel of John (John 1:45-51, and 21:2). The Gospel passage read at Mass on the feast of Saint Bartholomew is precisely this passage from John (1:45-51) where Nathaniel is introduced to Jesus by his friend Phillip, and Jesus says of him "Here is a true child of Israel. There is no duplicity in him (1:47)." We are presented with the Apostle's character in this brief and beautiful dialogue with the Lord Jesus. He is a good Jew, honest and innocent, a just man, who devotes much time to quiet reflection and prayer - "under the fig tree (1:48)" - and has been awaiting the Messiah, the Holy One of God. At Jesus' mention that "Before Philip called you, when you were under the fig tree, I saw you (1:48)," Nathaniel responded "Rabbi, you are the Son of God! You are the King of Israel (1:49)!" Being "a true child of Israel," Nathaniel was a man well-read in the Scriptures and knew what they said of the Messiah and where he would come from. This is why he is skeptical of Phillip's claim that Jesus is the Messiah, "Can anything good come out of Nazareth (1:46)?" But Nathaniel was lacking "duplicity" - that is, his heart was undivided, his intentions pure - his openness to reality was always ready to recognize and surrender to the truth when he encountered it. He remained open to his friend Phillip's invitation to "Come and see (1:46)." In encountering Jesus and hearing His words, he found himself face to face with the Truth Himself, and, like John the Baptist's leap in his mother's womb at the Lord's presence, Nathaniel's words lept out of his own heart in a clear and simple confession of faith, "Rabbi, you are the Son of God! You are the King of Israel!" Jesus, in Matthew 5:8, says, "Blessed are the pure of heart, for they shall see God." In Nathaniel we have an example of the pure man who sees - recognizes - God when confronted with Him, and on seeing Him believes in Him, and upon believing in Him, follows Him. Nothing is known for sure about the life of Nathaniel/Bartholomew after the Ascension of Jesus, but tradition holds that he preached in the East and died a martyr's death in Armenia, being flayed alive for having won converts to the Lord Jesus.